FLOATY CHIFFON FEEL FABRIC. BLACK PLEATED DRESS. HIGH NECK ALMOST HALTER STYLE. KEYHOLE AT BACK & TWO BUTTON NECK FASTENINGS. NAPE OF NECK TO HEM APPROX 31" LONG. IDEAL PARTY COCKTAIL OCCASION. Next ladies black long sleeved shift dress size 8. Draped / Cowl Neckline. NEXT Black Sequin Evening Dress. Machine washable inside out at 40 degrees. Do not tumble dry. Do not iron. Cap Sleeves. UK Size 12. Black Sequins. Ladies lovely pale purple sleeveless party dress by NEXT. Machine washable chiffony material is polyester - no stretch. Size 22 - never been worn. Silver Glittery Thread running through the material. It features a beaded halter neck and is in a fitted glamorous style. A quality black, beaded, halter neck dress by Next. Size 8 - Tailored fit. Approx knee length. Length of dress from top of zip to hem is approx. Cap sleeves with V neck. Bottom part of the dress is faux black leather (all the way round). Beautiful dress. NEW NEXT BLACK VELVET & LACE DRESS. Size 10/Eur 38. 42" (107cm) length from underarm. Pretty dusky pink 100% silk dress. Side zip and fully lined in 100% polyester. IT IS IN A PURPLE COLOUR AND IS A STRETCHY CHIFFON TYPE MATERIAL. THIS IS A LOVELY DRESS FROM NEXT EITH LOVE. LOVELY DRESS FULLY LINED. THE SKIRT HAS A NICE SWIRLY FEEL TO IT WHEN WORN. Ladies Cocktail Dress- size 8 - Navy with small Beads in swirl pattern. Size: UK 14, EU 42. Pit to pit: stretches to 18". Strapless black mini party dress. Length 30". A lovely dress from next, in exc. Only worn once. Gorgeous dress from Next size 8 silver grey colour. 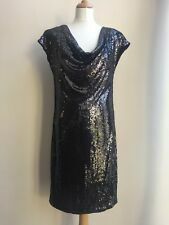 Very flattering black V Neck (back & front) occasion/party dress by Next, it's lined, lovely on, it falls beautifully, sadly doesn't fit, UK size 12. Smoke free home. I aim to be accurate but please inspect all pictures & ask any questions before bidding/purchasing. Im lots & happy to combine postage costs, so take a look at my other items if you have time. Inside Sleeve 19". Underarm to underarm 19" plus lots of gathers. Ruched Front. Slate Grey. Pencil Split Dress. Cap Sleeves. Location: 16. Vibrant Pink shift style dress with flattering drape folds across the skirt. Size UK 8. chest (armpit to armpit) 43cm (17"). shoulder to hem :97cm ( 38" ). Lovely Next little Black dress for lady of style And class . look.great ! HERE WE HAVE A LADIES DRESS FOR SALE. It's quick & it’s easy. As always with red, it's very difficult to photograph; the dress is in classic red and is tiered. Lovely and unusual red occasion dress in size UK 16/ EU 44. Top of nside of chest is rubberised to keep dress up. Lightly boned. Fully lined. DRESS HAS ROUND NECK & IS SLEEVELESS. IT IS BLUE WITH WHITE FLECK IN IT. SIZE 10 FROM NEXT. IN EXCELLENT WASHED CLEAN CONDITION. Has white lining that shows through the open work at top of back. lovley unusual dress. length 33" from under arm to hem. Ladies maxi length cocktail dress with stretch. Floppy feel material. Size 12 Petite. 100%polyester,lining 100%polyester. I have a cat. This dress is in excellent condition! Underarm to underarm: 17". Total length: 34". Next Women’s Ivory embroidered Neck tiered Dress Size 12. 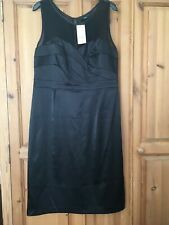 Beautiful black dress Size 8 Brand new with tags Halter next Tie up waist Zip on the side Slit at the back on the bottom of the dress. Sad to sell it but I will never fit into it.